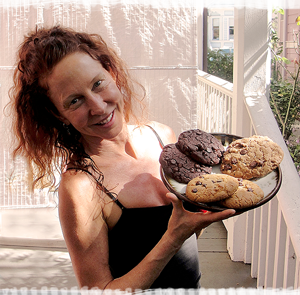 For more than 20 years, Kerri Kreations has crafted freshly baked vegan organic cookies for happy customers throughout the Bay Area and Central Coast of California. Kerri prides herself on choosing only premium, top-of-the-line ingredients. Cookie maker extraordinaire Kerri, has passion for what she does. Concocting and creating with verve for well over 10,000 hours, Kerri has turned the art of the cookie into a whole new model. We invite you to taste the difference! As a health conscious individual, Kerri is passionate about making nutritious treats that are environmentally sustainable, which is why she created organic recipes. Moreover, Kerri Kreations recycles about 80 percent of all materials while regularly donating cookies to non-profit organizations and other initiatives to support worthwhile community programs.